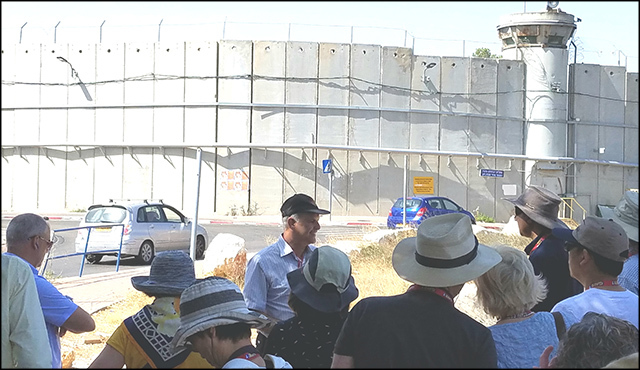 ISRAEL MISSION 2019WHY WALLS DO WORK! In addition to the exciting Jerusalem Day celebrations and our border wall expedition we present a very solemn event with Gold Star Parents, Karen and Billy Vaughn. The Vaughn’s will lead an inaugural Tree Planting Ceremony on the shore of the Jordan River in memory of their beloved son Navy Seal, Aaron Vaughn and the 30 American Heroes who perished with him in Afghanistan on August 6, 2011. Our unique and dignified ceremony includes a military color guard and VIPs from America and Israel. The 2019 mission to Israel will study and evaluate Israel's border walls and barriers in light of the border crisis in the United States. Do walls work? Yes indeed they do! We will see first hand how border wall and barriers stop close to 100% of any illegal penetration to Israel. In addition, we visit the border of Israel and Egypt on the Sinai peninsula, the Gaza border, the Lebanese, Syrian, West Bank and most importantly the security wall in Jerusalem. You will meet with local leaders, academics and researchers, intelligence officers, police, military leaders, government officials and counter-terrorism experts. In addition, you will have an opportunity to visit some of Israel's most historic--and the Western world's most sacred--sites, including the Western Wall, the Temple Mount, the Sea of Galilee, and the Golan Heights. Please review all website sections For more information call - 561-582-1424. On this fact-finding expedition, we will explore the swirl of issues surrounding events at sites that are both ancient and contemporary: The Gaza Strip - Hamas, The Lebanon border - Hezbollah, The Syrian frontier – Radical Islamists, and exploring West Bank - a ticking bomb? There will be a special emphasis on the post-Obama realities in the Middle East, and specifically the US-Israel relations affecting the entire region.